DIETRICH LASA, founder of the International Violin Competition, grew up in Germany. He joined the Tibor Varga Chamber Orchestra in 1972 and from 1982 he toured with the Stuttgart Chamber Orchestra throughout Europe, America and Asia. His dream country was Australia, and therefore he decided to resign from the Stuttgart Chamber Orchestra to join the Queensland Symphony Orchestra in 1985. Dietrich also taught the viola at the Queensland Conservatorium of Music. He has been involved in numerous performances (violin and viola) and recordings both in the classical domain and in the popular arena. 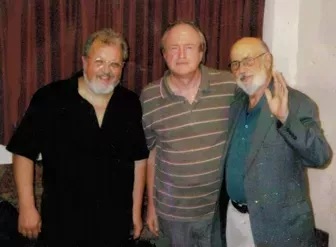 For example, Dietrich teamed up with John Denver when he required a string quartet to accompany him, and on another occasion Dietrich accompanied Frank Sinatra. Since the mid-90's Dietrich has been director of Australia's popular 'Animato', serving string players in Australia and abroad. Animato Strings is a major sponsor for this competition. Spiros contributed with his creative ideas to the emergence of the Animato International Violin Competition, Brisbane. 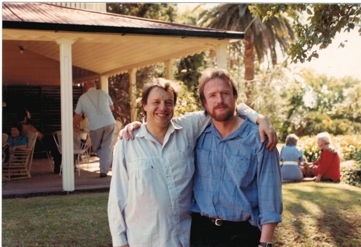 Spiros Rantos (left) with Dietrich Lasa at the Taabinga Spring Music Festival 1988.